The Republican National Convention ended its third night with just as much confusion, drama, and division as ever. But there's another attribute that seems to be creeping into nearly every aspect of the primetime reality TV drama: hate. Attacks on Hillary Clinton have reached a level unseen at conventions in the recent past. Besides the Trump family attempting to paint Donald as a guy who is "well liked," nearly every speech has focused on her, connecting her to Boko Haram, Bashar al-Assad, or the Devil. Then there was this one terrifying RNC photo that summed up the convention of hate. It was shot Wednesday night at the end of Laura Ingraham's speech, which of course painted Clinton in a less-than-friendly light. She also sang Trump's praises, more effectively than most. But then this happened. After she finished, she put her arm up in the direction of the jumbotron with Trump on it and made a gesture that looked an awfully lot like the Nazi "Heil Hitler" salute. She then quickly changes it into a wave and turns toward the crowd. But the moment of her seeming to salute Trump, who on screen is nearly returning the gesture, was captured for eternity. And it does seem pretty representative of what we're seeing so far, though it's not clear if Ingraham was aware of the salute that she was making or if that was her intention. 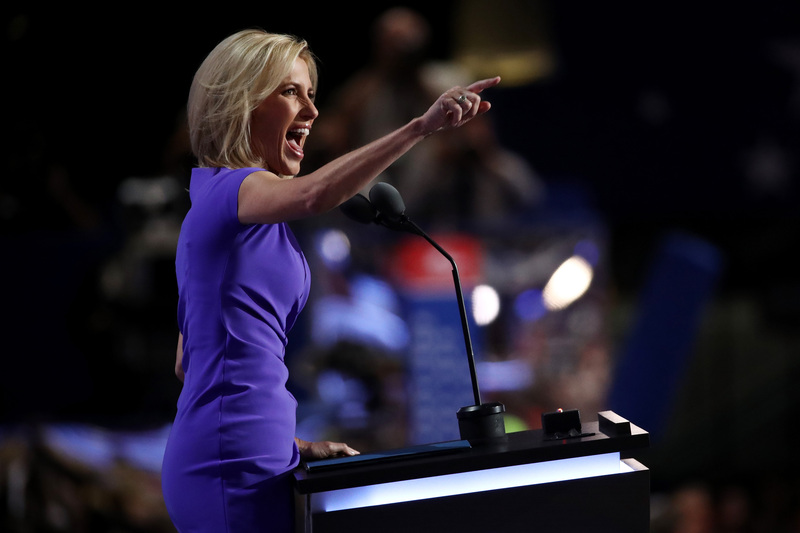 As Jezebel reports, Ingraham hasn't publicly addressed the meaning behind the salute. She Tweeted about Ted Cruz and the RNC repeatedly overnight and into Thursday morning, but didn't address the gesture specifically. She did Tweet a photo of Hillary Clinton with her arm raised and the caption, "It's Hillary... hands down!" as well as describing the reaction as "the left-wing "gesture" of desperation," implying that viewers and the press had misinterpreted her intention. She may not have meant anything. But then Trump thanked her on Twitter with the hashtag #AmericaFirst, which of course was the name of a movement in the 1940s that included a lot of anti-semitism and U.S. nationalism. CNN reported the group "was associated with anti-semitism and even support for Germany" in the lead up to WWII. Then, of course, there's the blatant hate we've seen and heard. That reached a new low when New Hampshire state representative Al Baldasaro, a Trump delegate and Trump veterans coalition adviser, said on the radio that "Hillary Clinton should be put in the firing line and shot for treason" for not increasing security at embassy compounds before the Benghazi attacks. He went on to call her "a piece of garbage," BuzzFeed first reported. The Secret Service is now investigating the incident. The live chat feature on YouTube has been disabled for the live stream of the RNC convention after it was taken over by anti-semitic Trump supporters. The former Republican Governor of Hawaii, Linda Lingle, was speaking about the recent success Republicans have seen among Jewish people and the importance of being tougher on Israel then the Democrats. But the online commenters stuck to nasty, scary, and anti-semitic insults. Those examples are just a product of the vile discourse that has echoed from the convention stage since Monday. There was Rudy Giuliani's rage face that focused on the impending doom of the nation. On Tuesday there was Chris Christie who tried to connect Hillary Clinton to Boko Haram and some of the other current villains in international relations. He was overshadowed, though, by Ben Carson who connected Clinton to "Lucifer." And now, Wednesday, the vice presidential candidate Mike Pence has attacked Clinton on Benghazi again. This cacophony of hate was not lost on Bill Maher and his guests Wednesday night. "Now, for people who may not have watched conventions before — some of them are coming into it for the first time — the hate," he said on a live edition of Real Time. "Now, all conventions are about tearing down the other side, to a degree. But by standards, how would you gauge this convention’s hate? It’s a little off the chart." "Off the chart" is an understatement when it allows for over-the-radio murder threats of Democrats and anti-semitic Republicans to run amok online. There is, of course, the possibility that Thursday will take a turn toward tolerance, understanding, and cooperation when Trump takes the stage, but I wouldn't hold your breath. He's just tried to minimize our commitment to fellow NATO members, which is not exactly working together. Given where it's going, the salute photo may very well be the most representative photo of the convention, whether Ingraham meant to make that salute or not.